Ryan E. Smith is an Associate Professor of Architecture at the University of Utah, USA. He has investigated offsite design and construction for nearly a decade through industry-applied research. 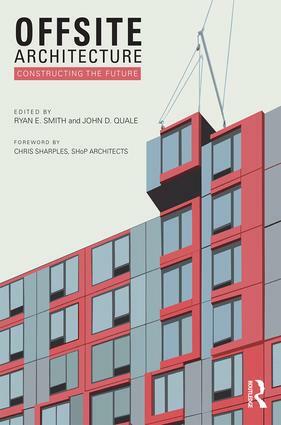 He is author of Prefab Architecture (Wiley, 2010) and Building Systems (Routledge, 2012). He is past Chair of the Board of Directors of the National Institute of Building Sciences Off-Site Construction Council. He is a Senior Research Fellow at the Centre for Offsite Construction at Edinburgh Napier University in the UK. John D. Quale is Director and Professor of Architecture at the University of New Mexico School of Architecture and Planning, USA. His expertise is in sustainable design, affordable housing, prefabrication, the environmental impact of construction, and collaborative and integrated design processes. He is the author of Sustainable, Affordable, Prefab: The ecoMOD Project (UVA Press, 2012) and Trojan Goat: A Self-Sufficient House (UVA Press, 2002), about his leadership of the 2002 UVA Solar Decathlon Team in a national design/build house competition sponsored by the US Department of Energy.